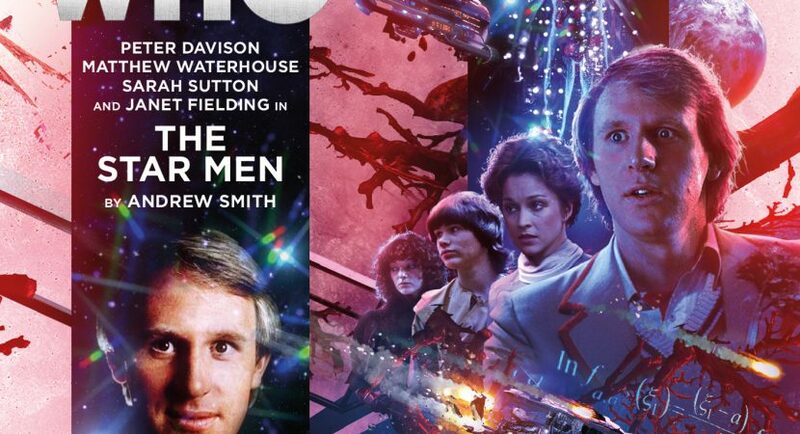 Adric joins the Main Range for a classic Who SF adventure beyond the rim of the galaxy. There’s no Trek villains with glowing eyes, but the glowing Star Men make exploration equally challenging for humans trying to Boldly Go. Writer Adam Smith, who wrote Adric’s first story Full Circle back in 1980, offers an imaginative take on humanity’s last frontier. He sketches out some excellent worldbuilding with futuristic bases, deep space exploration ships, alien worlds, and a dash of hard science and maths for Adric and friends to sink their teeth into. There’s some truly creepy and dangerous antagonists that wouldn’t be out of place on new Who (because the FX of classic Who wouldn’t be up to the job). Doctor: As the Star Men will discover, so am I. …despite his defiant words, is somewhat backgrounded in favour of Adric (mostly), Nyssa, and the various guest characters, from the well-intentioned but outmatched Controller to some overly-confident military types. The Crowded TARDIS is always a challenge to write for. On the one hand, Big Finish is an improvement over classic Who in that all the companions do play an important part at some point, but on the other hand, the Doctor is often reduced to being a cheerleader for his friends or pleading futilely with the villains. He does at least do a fair amount of fast-talking and mystery-solving in this story. Peter Davison and guest star Peter Guinness have a fine time pulling out their acting chops for some good protagonist-antagonist verbal fencing. It’s no secret I like the Fifth Doctor era, and I always love hearing from them in all their different iterations. I believe crowded TARDIS stories can be some of the best Doctor Who out there. The rapport between Mark, Sarah, Janet and Peter made the older!Nyssa arc my favourite Big Finish so far, right up there with the best of the Pertwee UNIT years. But (you knew it was coming) I think this audio was a bit of a shakedown cruise, with better things to come. The setting and SF parts of the story were fantastic, but the characterisation and dialog were awfully basic — much more like 1980s Who than what Big Finish stories are capable of delivering. Matthew is still knocking the rust off, and it was a big ask to throw him into love scenes so soon. As such, I found myself cringing a bit. It’s not a bad story, and it’s certainly exciting , but I… want more? That said, I’m very much looking forward to The Contingency Club. Autumn had potential, but her infatuation with Adric was so obviously written by a man that it had me and another longtime BF listener shaking our heads. Of course she was immediately dazzled by him. Of course she had to be fridged at the end of the story. One could see it coming a mile away. I usually objected to classic Who characters forgetting deaths ten minutes later (see: Adric). But In this case, I am not up to hearing Adric mope about a female character whose sole reason for existing, and dying, was to provide him with manpain. The romance storylines for him in A Full Life were much, much better (and bi, which, yes, does matter to me). Continuity Note: Tegan is still asking to be taken to Heathrow, so this is before Black Orchid, by which time she’d decided to stay.